Master a few new recipes as I bring you 10 Seafood appetizers that you’ll love. No matter if you’re serving shrimps, oysters, crab, crawfish or langoustines there’s a recipe for you in this collection, let’s go! I love to make seafood appetizers, usually the seafood taste so great you don’t have to push yourself or make things too complicated. The seafood is just so good its simply not required. 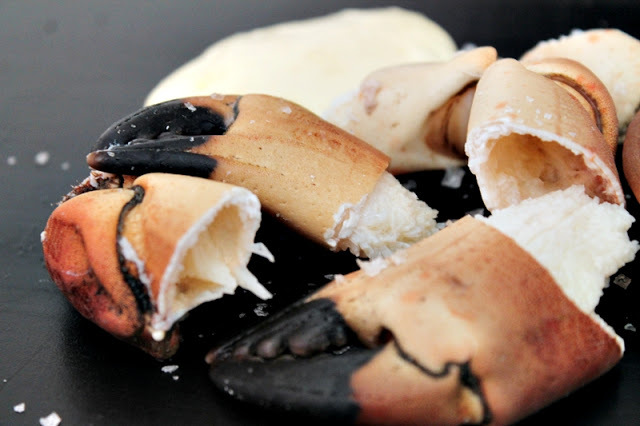 Just think of some of your favorite seafood dishes. I can’t know for sure but I’m guessing that at least one or two of your favorites is a very simple dish like a crab with butter or grilled shrimps with chili or garlic. Am I right? Maybe I am, no matter what it often comes down to the simple things. I’ve made a whole bunch of different seafood appetizers and now I rounded up 10 of them that I really love. Most of these are very simple to make, some are a bit more complicated, they are all delicious. Let’s check them out, all of these have been published here before so if you want to check out the original recipe there is a link in each name of the dish, click it and there will be even more details and photos. Enjoy! Cut the limes in half and cook them in a frying pan in a little bit of oil until they are browned. This will heat the lime and give the juice a slight burnt note and make it taste a bit sweeter. It also looks cool, food stylists love to do this with lemons and limes all the time. 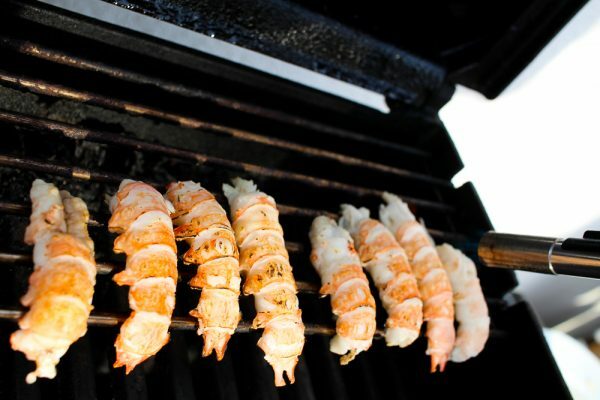 Dice the chili, grill or sear the shrimps quickly until they are done, then toss them in the chopped chili. Cut the asparagus in half lengthwise and toss them in a few drops of olive oil and then grill them. 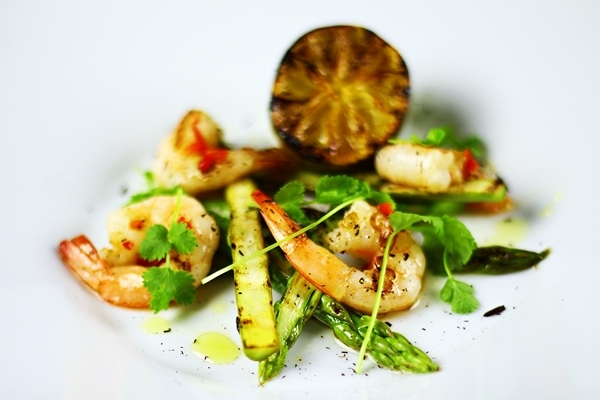 Arrange the shrimps and asparagus on a plate, squeeze over the warm lime and add some fresh cilantro and some extra salt and pepper. Serve. Peel the shrimps and broad beans. Set aside. Boil the egg, I boiled this one for five minutes and added it to already boiling water. You can adjust if you want it boiled more, but remember that the creaminess of the yolk is a big part of this dish. If you overcook the egg it will not be as good. Once the eggs are done peel them and then add one egg to each serving bowl. Sprinkle with salt, add the beans and shrimps to the bowl and then cut up the egg. Add the dill on top. Serve! 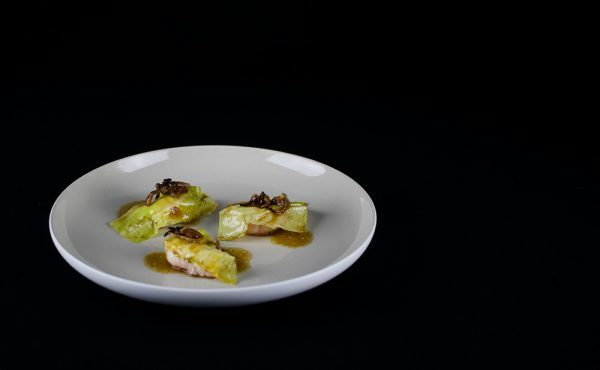 I’m using cooked langoustines for this dish, if you can find raw ones that would make it even better but you’ll have to cook them of course. Peel the langoustines, save all the shells for the vinaigrette. Pad the langoustines dry on the surface with some kitchen paper. Then torch them with a creme brulee burner for a few seconds each. This will gently roast them and give them somewhat of a seared flavor. Like I already mentioned with raw ones it will be even better but this works. Also, the torching part is the last thing you do before serving the dish. Add the shells, garlic and onion to a pot and cover with water. Bring to a boil and let simmer for about 30 minutes. Strain the liquid into a pan and reduce until about half a cup (1dl) remains. Empty the liquid into a pot. Add the butter to the pan and brown it over medium heat. 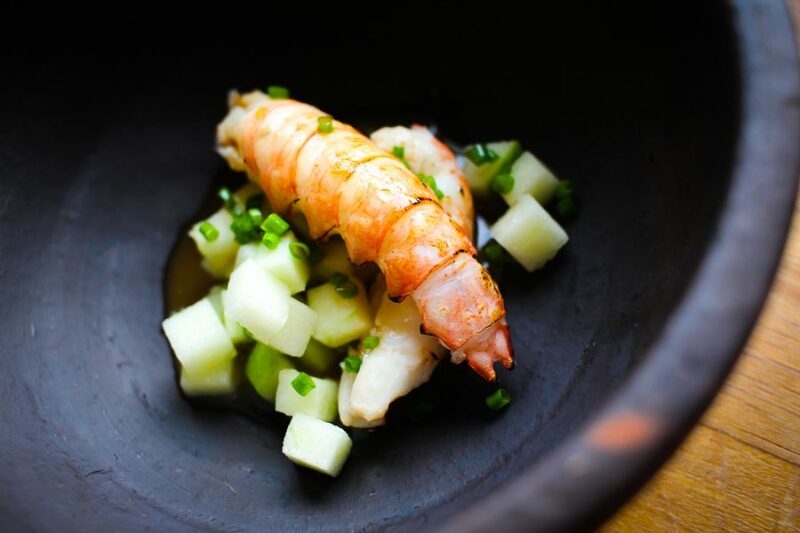 Then combine the butter and the langoustine broth, season with salt if necessary, gently heat before serving. Dice the apple, combine with the olive oil and season with salt and black pepper. Grate the ginger into the apples. Done. 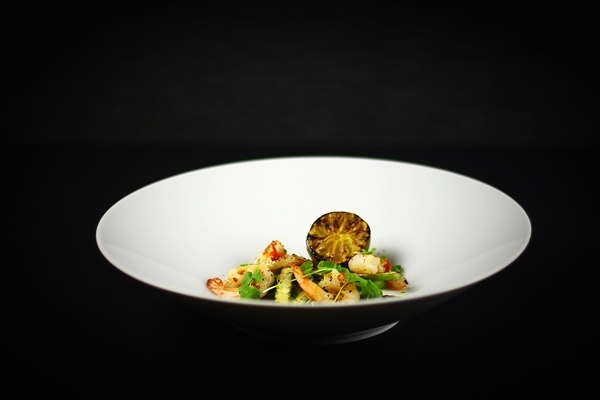 Add the apples of the bottom of the plate, then add the langoustine tails, two for each serving. Sprinkle with sliced chives. Add one or two spoons of warm vinaigrette on top and a few drops of olive oil. Serve immediately. Add the juice from the oysters to the sauce and add most of the parmesan cheese. You should have a thick stew of spinach and cream with a clear taste of garlic. 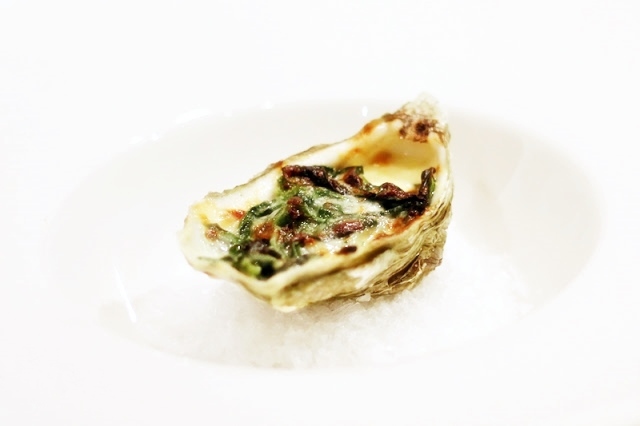 Place the oysters on an oven proof plate and add a spoonful of spinach sauce to each oyster, grate over some more parmesan for each oyster and put in a hot oven for a couple of minutes. I set my oven on grill with 175 Celsius / 350 Fahrenheit. It took about 5 minutes to get them fully cooked. Take out and serve warm. If you’re having trouble getting the oysters to stand flat when putting them into the oven you can use a cupcake tray as a tool. A bed of salt works well too. Good luck. 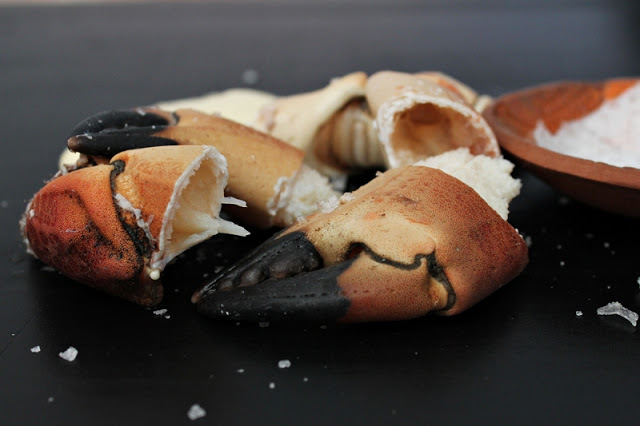 Not much to it, if you can’t find raw crab claws then it’s fine to use cooked if you have a good place to buy shellfish. And if you’re feeling extra lazy go ahead and buy the aioli as well. If not then follow the recipe below. 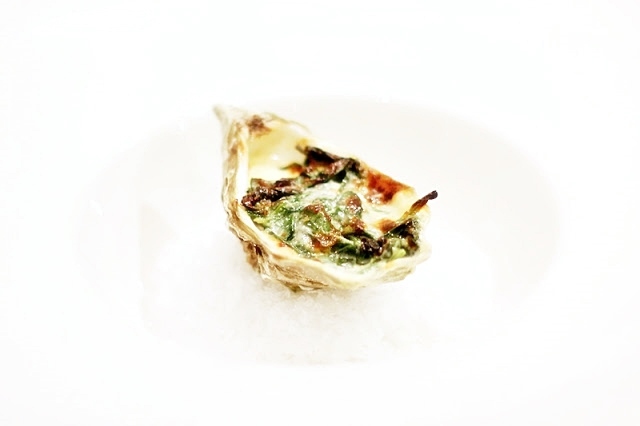 People like to put beer, sugar and all sorts of things in the water when they cook shellfish. I prefer salt, water and dill. Bring water to the boil, add the salt and if you’re using dill then that too. Taste the water, it should have about the same saltiness as sea water, somewhere between 3-5%. When the water is boiling add the claws and bring the water to boil again. Then remove from heat and let cool in the water. You can serve them warm or cold. I use half a teaspoon of mustard and a small clove of garlic for each egg yolk but adjust according to taste. Whisk the egg yolks with the mustard, vinegar and crushed garlic, add some salt and pepper right away. Add the oil slowly and whisk during the whole process, stop adding oil when the aioli is thick enough. Season with mustard, garlic, vinegar, salt and pepper according to taste. Good luck! Chop the garlic, chili and onion. Heat the oil in a frying pan and add everything besides the crawfish, let cook on low heat or five minutes. Split the crawfish, turn up the heat and add them to the pan, toss them in the pan for about 30 seconds. Remove and serve. Combine water with the dashi powder and bring to a simmer, season with the soy. Soak the wakame in water for ten minutes. Discard the water after soaking and add the wakame to the dashi. Roughly chop the red chili and mix in a blender with a little bit of vegetable oil until smooth. Slice the leeks and chives, sear the scallops in the olive oil, season with salt and pepper. Slice the seared scallop in a few slices. If the scallops are small then serve more than one. In a bowl add the wakame from the dashi and put the scallop on top, add the leeks, chives and a few drops of chili oil and some sprinkles of dried chili. Finally, add the dashi broth on top. Serve warm. 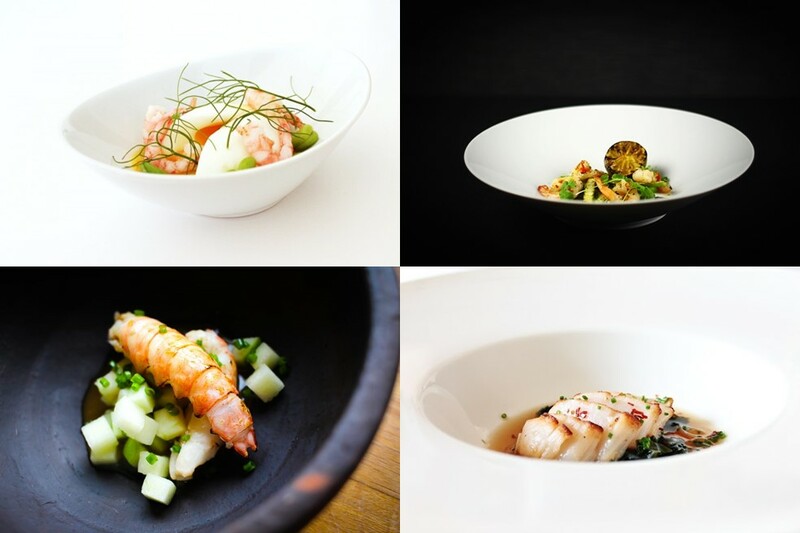 I divided this recipe up into parts, let’s start with the langoustine and then go through each part. Once it’s time for plating the only thing you have to worry about is keeping the cabbage and butter warm, the rest can be prepared ahead of time. The recipe serves four as an appetizer. 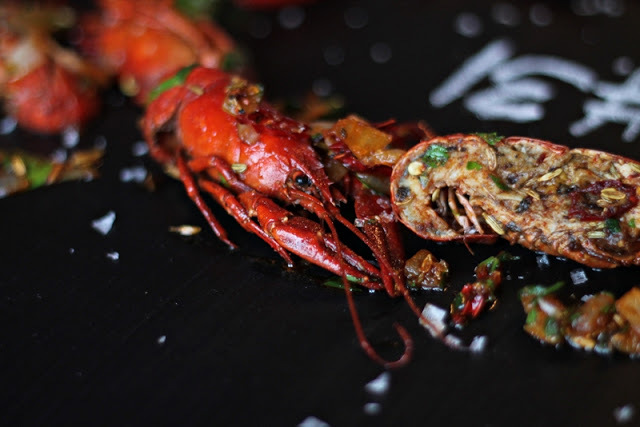 I could only find cooked langoustines when I did this recipe, I do think it would be even better with raw pan-fried ones but I worked with what I could find. 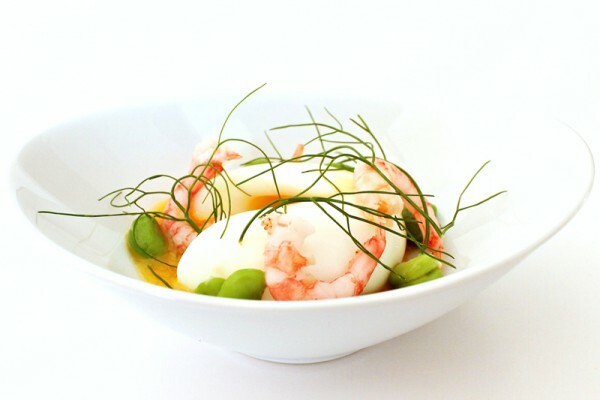 If you can’t find langoustines any similar crustaceans will work like langust or lobster. Remove the tails and peel them, keep at room temperature if you will be serving within an hour, otherwise chill them. Save the shells for the butter vinaigrette later. Remove the thin outer layers of the cabbage. Cut up into 12 large pieces. Each piece should cover one langoustine tail. Rather make them too big as they will shrink a bit when you fry them. 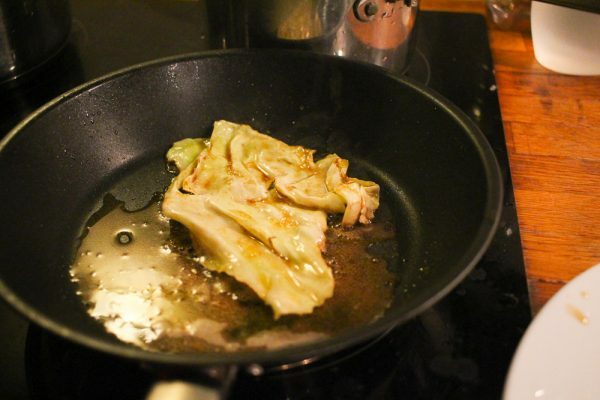 Heat the butter in a pan on medium to high heat and quickly fry the cabbage, season with salt and pepper. Save the butter in the pan for the butter vinaigrette. If you have a good homemade mayonnaise already you can simply flavor it with Japanese soy. If not just follow the instructions below. Add egg, soy, vinegar, mustard, garlic and the lemon peel to a small mixer or use a handheld blender. Blend together, then add the oil while mixing so it emulates into the mayonnaise. Check the seasoning and add a bit more salt if necessary. Peel and slice the shallots thin. Cook them in a pan in the oil on medium heat until crisp, season with salt, remove and allow to drip off on some paper to remove excess fat. Add all the shells from the langoustines into a pot and cover with water. Add tomato paste and then simmer for 30 minutes. Strain the liquid and then boil down until you only have a few spoons of concentrated broth. Heat the pan with the butter from the cabbage and add the rest of the butter. Brown the butter. 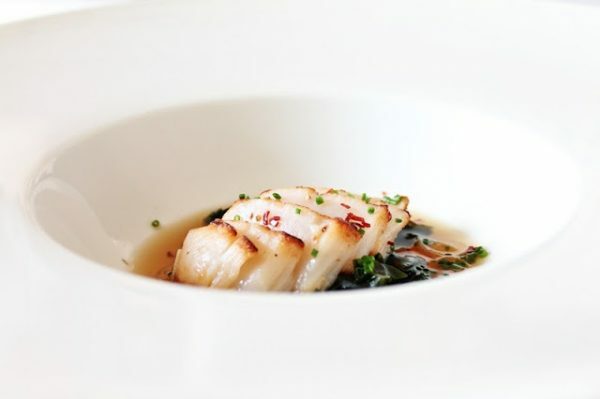 Set aside and add the langoustine broth a little at the time. Add a squeeze of lemon juice. Check the seasoning, the ratio should be about 3 parts butter to 1 part broth and 1 part lemon. Keep warm. 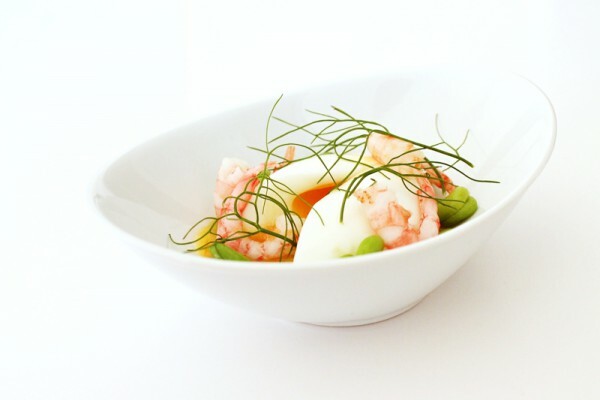 Add three langoustine tails on each plate, add half a teaspoon of mayonnaise next to each tail. 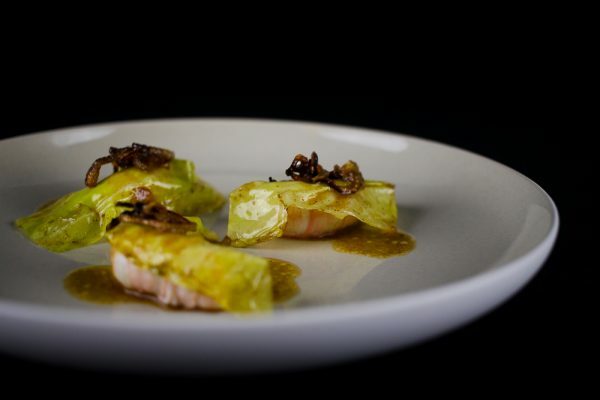 Put one leaf of cabbage over each langoustine, then add a few slices of shallots on top of the cabbage. Finally, spoon over the butter vinaigrette over each tail. Serve immediately. 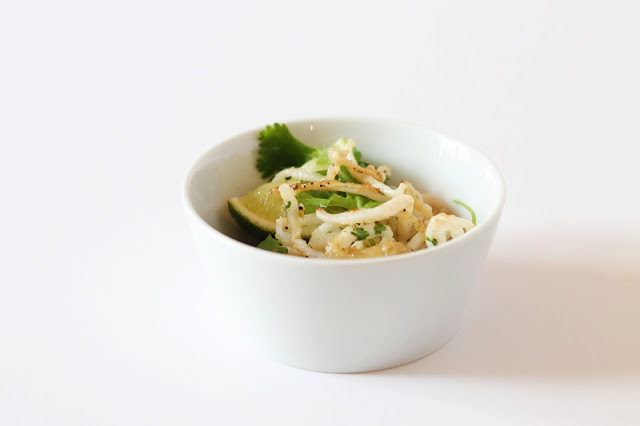 Slice the calamari as thin as you can, slice the spring onion. Heat olive oil in a pan over high heat and add the calamari, sear it for about thirty seconds constantly stirring. Add salt and pepper and then the spring onion. If it starts to dry out then add a little more olive oil. 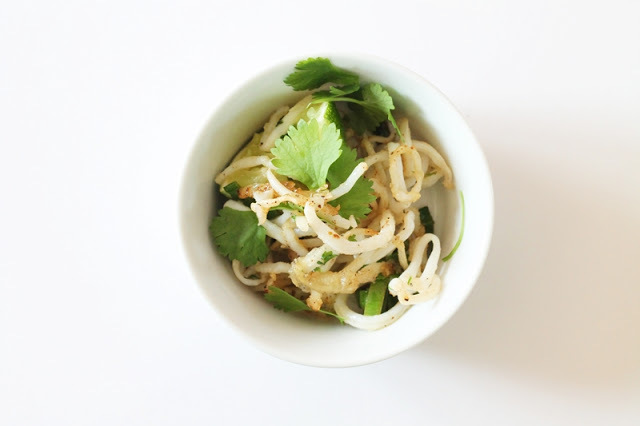 Finally, squeeze in lime juice and some roughly chopped cilantro, serve immediately. Roughly chop the shrimps and dill, add mayonnaise and combine. Season with horseradish, lemon, salt and pepper. 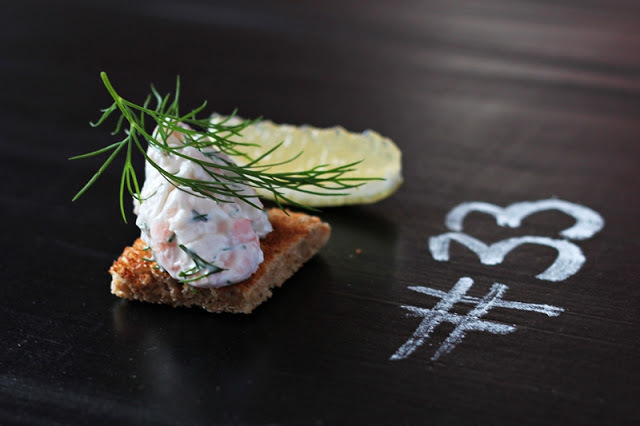 Toast the bread, cut some wedges of lemon, put the Skagen on the toast, garnish with dill and lemon.